If like me, you're ready to ditch the snow boots and add a spring into your step I have just the inspiration you're looking for. These looks are perfect for wearing now- just swap out sandals for ankle boots and layer on tights or a leather jacket. I adore this palette of muted pastels paired back to minimal but statement making accessories and strappy sandals. I've always loved pieces that can easily be mixed and matched with each other, but after minimizing my wardrobe using the "Life Changing Magic of Tidying Up",Konmari Method, that has been taken to an entirely new level. With less pieces in my wardrobe, I want them to be versatile. When I go shopping I really try to evaluate if a piece will bring me joy and something I get excited to pull out my closet (more on that here). I think the best part about each of these outfits is their versatility. Pair the striped tee with denim & white lace-up sandals or the pink seaglass necklace with the chambray dress. Literally, I want to rock look #1 for our Valentine's Day date. 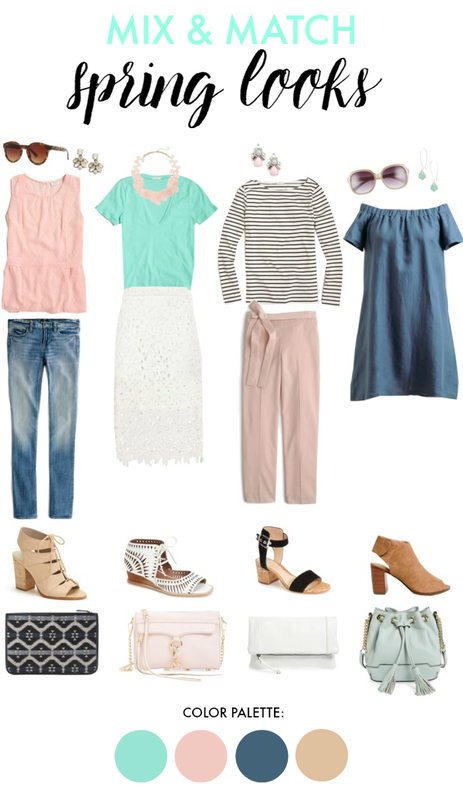 Which spring style is your favorite? I am so ready for spring fashion to come back! I love this selection of shoes! Summer heels are my favourite.